Profile of a Female Motorcyclist: Meet Kate | Helmet or Heels: I'm comfortable in either! We are going to jump the pond over to London, UK and meet my next guest Kate or KP as her friends call her! I love cyberspace because you never know who you’ll meet. Kate is another woman that stopped by the blog, left a comment, and I jumped at the opportunity to invite her too! You can find her on Twitter @laminch and she’s started a blog Motorbikes, adventures, life! How did you learn to ride? It was a long five months that started with an awful bike school in central London and finished up with the amazing Valley Bike School in Lancashire. It took me a couple of attempts but I think that worked in my favour. It meant that I had more lessons, took it at my own pace and passed when I was truly ready. What was your first motorcycle? A Triumph Speedmaster in cranberry red. A real beauty and an ideal first bike. Stable, great for those with shorter legs (although I’m fairly tall at 5’ 7” so that was less of an issue for me) and wonderful for leisurely rides to the coast with friends. How many have you owned? I’m onto my second after only seven months! 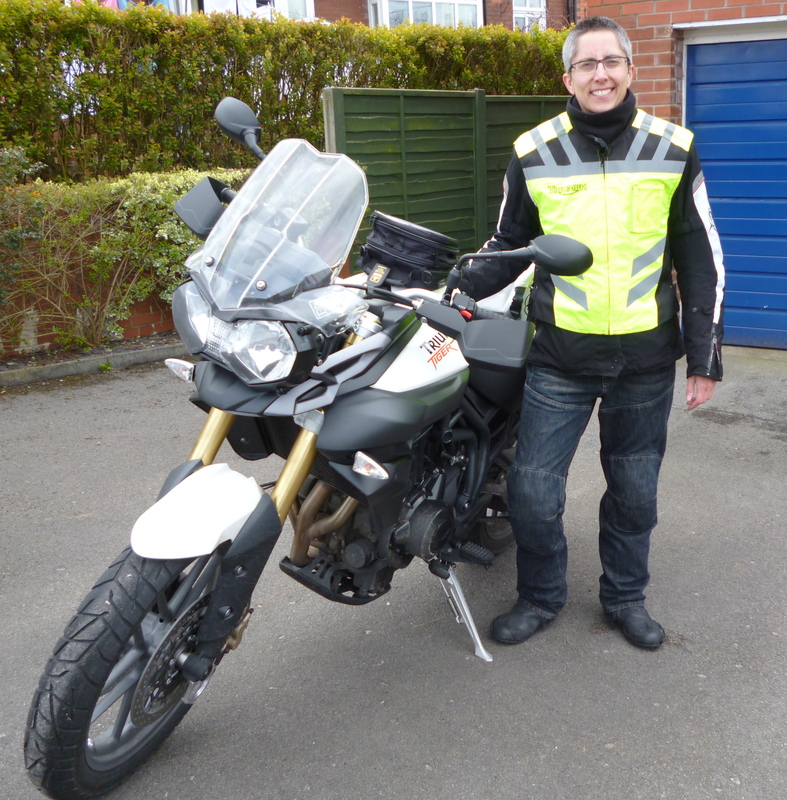 My ‘biking personality’ emerged fairly quickly and I have moved onto a Triumph Tiger 800. More practical for my needs but also fits well with my lifestyle and interests. Why did you want to ride a motorcycle? I’d loved the idea since I was a kid, but as I got older it was about adventure and independence, challenging myself and a determination to make the most of life. Tell us about your riding. It takes me longer to get the bike out of the garage than it would to ride to work so as nice as it would be to commute on it, there’s not much point! Its pleasure and vacation for me. What advice do you have for women who ride or want to ride a motorcycle? Go for it, and ignore the hundreds of tales you’ll no doubt get told about accidents and friends of friends who died! Make sure you get to learn at your own pace and don’t put up with poor customer service, whether it’s from a school or a shop. You’re in charge. What is the longest trip that you’ve taken on your cycle? 800 miles, a trip up to my parents in Derbyshire combined with a few days enjoying the beautiful Peak District. Do you belong to any motorcycle groups? I have a group of friends I meet up with who have all connected through work, we range from adventure bike owners to Harley riders. Do you have a favorite riding story? 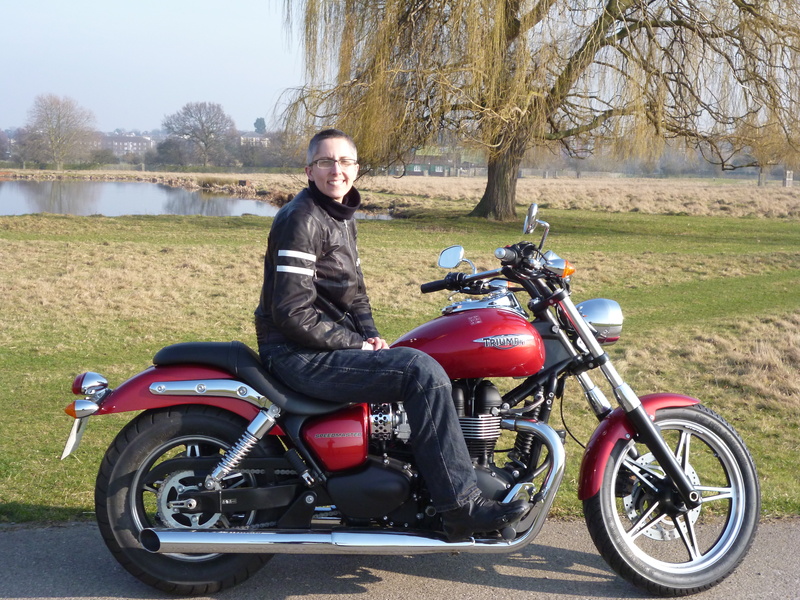 More ‘embarrassing’ than favorite but I’ll never forget it: Whilst I was still learning to ride my friend insisted I take his beautiful, gleaming Harley for a spin in private park land. I was doing really well, avoiding the deer that were enjoying the summer evening, gaining in confidence (while realizing that a Harley really wasn’t my kind of bike). When I pulled up I was taken by surprise by the weight of the thing and promptly dropped it, scratching some of the chrome and damaging a few bits and pieces. Turns out my friend is the most calm man on the planet, he didn’t flinch, helped me up and we have remained good friends. The guy deserves a medal! What do you do when you’re not riding? Work; I manage the front line staff at a Royal palace that is open to the public. Hiking, cycling, and exploring the art and culture scene in London. This entry was posted in Lady Riders and tagged Blogger, endorsement, England, Female Motorcyclist, first motorcycle, Harley Davidson, license, motorcycle, riding, Triumph, Twitter, women. Bookmark the permalink. Hi, Kate! Very cool to “know” a lady rider in London. I cannot imagine bike school in Central London. I have never ridden there but saw the way those crazies zip through traffic. Cheers to you! I notice you are quite the adventurer, more guts than me. I am not sure when your 40th year is but when you ride across Canada it would be a pleasure to meet you. I have never been in London but I imagine the traffic is inbearable, and also I don’t know how you can ride on the “wrong” side of the road. Helloooo Kate. A woman after my own heart. Aren’t Triumphs great? Nice choice in bikes. It is nice to see more women learning to ride and starting up blogs. I have added you to my blog roll and when I have time will catch up on all your posts. Nice to meet you Kate! I’m Eve, I don’t know how to chang my name on WordPress. Wow, you took the bull by the horns and went right for it when you decided to ride didn’t you! That’s great and you’ll have lots of adventures to come. The two riders above my comment, actually all three of them and I know a fella in London England, Gary France of Flies in Your Teeth. If you haven’t met him yet check him out. He has been on some incredible rides! Ride safe!!! !